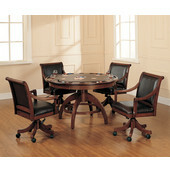 Be the envy of all of your friends by adding a high quality game table to your den or rumpus-room. 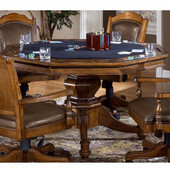 These game tables have a bar style top with glass holders and feature ample shelf and cabinet space underneath, sturdy construction, wine racks for storage up to 10 bottles, a rack for stemware, and of course interchangeable table games tops. 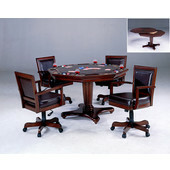 Brought to you by Powell and Regency, these game tables include game boards for Craps, Poker, and Roulette, and ensure that you will be the supreme party host. 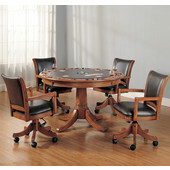 For a more casual get-together, our game tables include a hardwood bar top for hosting and mixing cocktails. 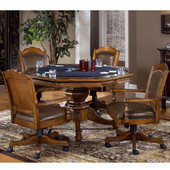 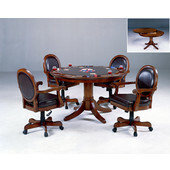 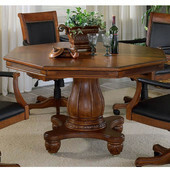 Game tables are available in stunning antique oak or cherry finishes and come in either Vegas or Tahoe styling. 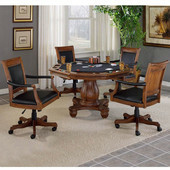 Chips, cards, and dice are included so you're ready to play as soon as your table is assembled.